No problem is too big for Rusty Rivets, Nickelodeon's inventive 10-year-old hero, who makes his DVD debut in Rusty Rivets. Available July 31, 2018, the eight-episode collection introduces Rusty, a creative young boy, who with the help of his imagination and incredible resourcefulness, is able to invent his way out of every jam by repurposing spare parts and found objects. Fans can follow along with Rusty and his best friends as they team up to fix a runaway remote control airplane, maneuver around a sinkhole, create a rocket to return some lost penguins and more. Inspired by the DIY culture of the maker movement, each Rusty Rivets adventure encourages preschoolers to use their creativity to solve problems. 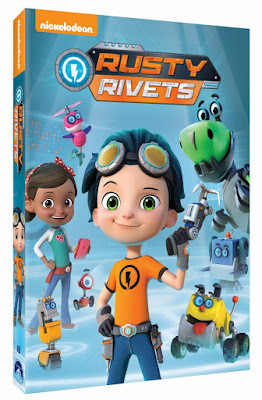 Produced by Nickelodeon Home Entertainment and distributed by Paramount Home Media Distribution, the Rusty Rivets DVD will include a never-before-released PAW Patrol episode, "Pups Save a Robo-Saurus" and will be available on DVD July 31, for the suggested retail price of $10.99. Rusty's Rex Rescue - When Liam and his stuffed dinosaur get trapped atop a tall stack of junk, Rusty and his team design a dino-mite rescue. Rusty's Park 'N Fly - When Mr. Higgins' remote control plane won't land, Rusty and his friends try different ways to get it down. Rusty's Ski Trip Blip - A ski trip to Planner's Peak comes to a halt after a sinkhole blocks Rusty and his friends path. Rusty's Penguin Problem - On a hot day, Rusty gets a delivery of... penguins! He and his friends must figure out how to keep the penguins cool on the way back to the Animal Park. Ruby Rocks - Right before the Sparkton Hills Talent Show, Ruby gets stage fright so Rusty and the Bits band together to help her. Rusty's Balloon Blast - After Liam hops into a giant helium balloon and floats away, Rusty and Ruby have to design a solution to bring him back down to earth. Rusty Dives In - After Ruby's tablet sinks to the bottom of the lake, Rusty and the Bits work together to get it back. Rusty Marks the Spot - When Rusty finds a pirate map made by his great-great-granddad, the gang must combine and design the clues to find the treasure. BONUS EPISODE: PAW Patrol: Pups Save a Robo-Saurus - When a Robotic Dino named Earl comes to life, the pups must find him and bring him home. Win: One lucky winner will receive a copy of Rusty Rivets on DVD! The deadline for entries is July 31, 2018 11:59pm HST. If you submitted an eligible entry and it is chosen by random.org as the winner, you will be notified via email on or about August 1, 2018 (make sure your email address is in your profile or comment and be sure to check your junk/spam, etc. folders) and will have 3 days to respond. I would like to win this for my nieces. My nephew would like this. I want to win, because my kids would enjoy this. i would like to win this for my kids, they would love it. Anna would so enjoy this! I'd love to win for my friend's kids. I would like to win the Rusty Rivets DVD because I think my 7-year old nephew would love it. I subscribed to your feed via email. 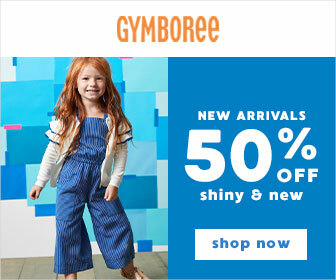 My email address is luckybutterfly47 (at) gmail (dot) com. I followed Hawaii Mom Blog on Instagram. My Instagram profile name is AllyG47. I followed Hawaii Mom Blog on Bloglovin. My Bloglovin ID is @alecia3. I followed Hawaii Mom Blog on Twitter. My Twitter ID is @ally47. I liked Hawaii Mom Blog on Facebook. My Facebook name is Alecia Gibson. I would love to win this for my littles. They love to watch this show! My grandchildren would absolutely love the very cool Rusty Rivets DVD. I have grandchildren that definitely would like the really amazing Rusty Rivets DVD. My nieces and nephews would really enjoy the marvelous and nice Rusty Rivets DVD. A wonderful Rusty Rivets DVD, my grandchildren would always like and love for lots of fun. I have nieces and nephews that would always want and like the fabulous Rusty Rivets DVD. My many children would just enjoy the awesome and fun Rusty Rivets DVD.